Wind Hill Cairn at Cheesden, near Roch- dale (the north-side). OS Grid Reference: SD 83262 14945. 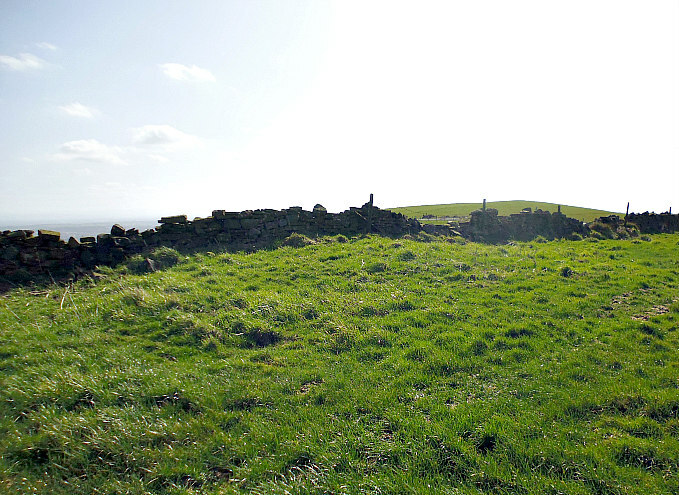 In a farmer’s field at the side of Ashworth road, Cheesden, near Rochdale, Greater Manchester, is Wind Hill Cairn, dating from the Beaker Period of the Bronze Age. 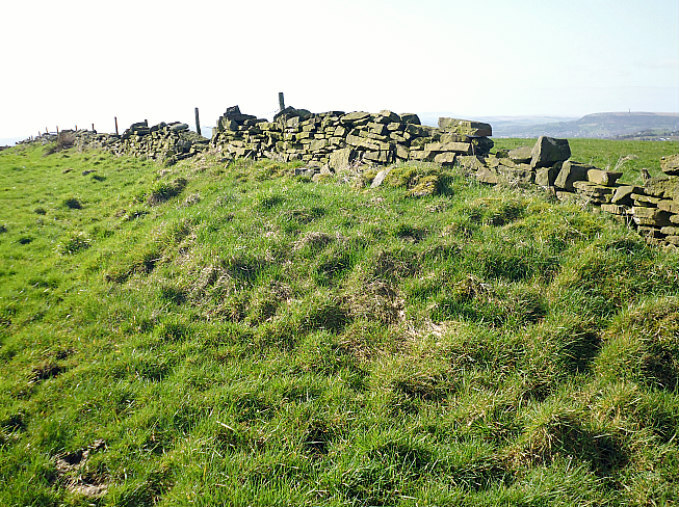 Now it is nothing more than a low, grassy mound at either side of the more recent drystone wall. 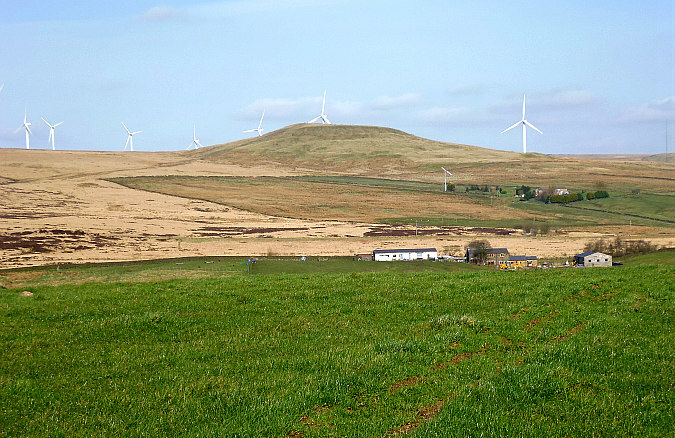 The cairn stands at the north side of Wind Hill, 298m above sea-level and overlooking Knowl Moor, with Knowl Hill itself rising over to the east beyond Edenfield road. A little further down the lane is Ashworth Moor Reservoir and, on the opposite side of Edenfield Road, is the famous Owd Betts public house. The cairn is in a damaged condition due partly, at its north-side, to farming, but on its south-side there is less damage and has, therefore, kept its circular identity. 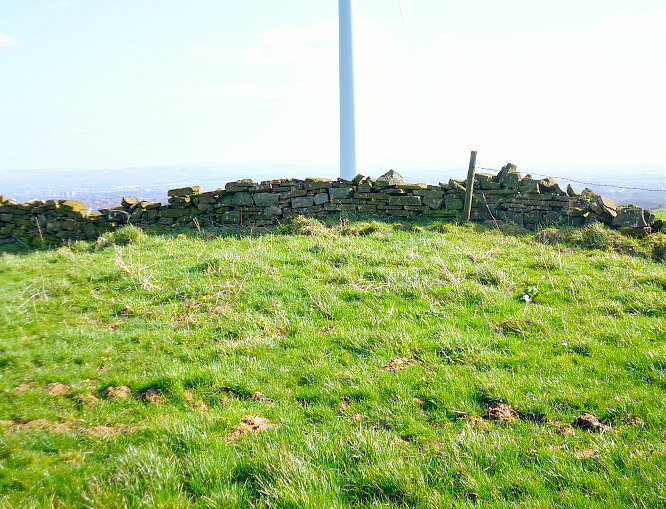 There is a footpath heading east across Wind Hill from Ashworth road, just above Wind Hill farm and the wind turbine, but the cairn is partly on private land (at its northern-side) where there is a locked metal gate next to the wall – beside Ashworth road. Wind Hill Cairn, Cheesden (at the northeastern side). Wind Hill Cairn at Cheesden near Roch- dale (the south-side). Originally Wind Hill Bronze Age cairn had a diameter of 10.45m (34 feet) and a height of 0.75m (2-3 feet) but it is now less than that due to destruction at its N side. According to the ‘Lancashire Archaeological Bulletin’ (1984) with the primary reference: Tyson, N (1972) at the end of the excavations by Bury Archaeological Group between 1968-72: this is a ruined cairn with a kerb of horizontal slabs. There was an opening to the E which was 6 feet wide with a subrectangular area outside that was defined by inward-leaning slabs that are further enclosed by a “satellite kerb”. Both of these kerbs were finally concealed. No grave pits were found, but at the cairn’s centre a flint knife, pebble hammer and a V-bored ‘jet’ button were discovered. Further to this information: there was a cist of sand-stones at the E side. The central and W parts of the cairn were denuded; the E and S sides were in a better condition and still visible. The dry-stone wall running in a straight-line through the middle of the mound ‘was’ dug deep into the structure, causing further destruction, and some of the stonework from the cist may have ended up in the wall itself, or could still be in ‘situ’ in the mound? There looks to be another “possible” tumulus at SD 83461 15136, some 290m to the east. Knowl Moor & Knowl Hill seen from Ashworth Road, Cheesden. In 1905 a Late Bronze Age socketed axe (palstave) was dug up by workmen building the Ash-worth Moor Reservoir, just along the road from Wind Hill cairn. There have also been a number of archaeological finds on Knowl Moor and on Knowl Hill itself including arrowheads in a variety of shapes: lozenge, leaf, stemmed and barbed, and many flints in varying sizes and a thumbstone. It would seem, though, that these finds have not originated from ‘settlements’, but from pre-historic man simply roaming the higher ground above the forested areas beside the river Roch – where today we see the highly populated towns of Rochdale, Heywood and Bury. On Hamer Hill (Rooley Moor) above the town of Rochdale – some recumbent stones were recently discovered which has led archaeologists to consider the distinct possibility that they form a stone circle, and on nearby Hunger Hill there are possible burial mounds. There have also been a number of coin finds from the Roman period in the Rochdale and Heywood areas. Lancashire Archaeological Bulletin, Vol 10, No. 2/3, May & July, 1984. Tyson, N., A Bronze Age Cairn at Wind Hill, Heywood, Lancs. Bury Archaeological Group, 1972. Categories: Barrow / Mound, Cairn / Cairn Circle | Tags: Wind Hill Cairn at Cheesden near Rochdale in Greater Manchester | Permalink.